Antistatic RTV-2 silicone elastomers from CHT have been developed for producing high quality pads for the printing industry. With a wide range of shore hardness and with clear definition, the pads offer a precise and safe printing process on a variety of materials like porcelain, various plastics or electronic components and devices. The elastomer has excellent release properties when printing on organic and inorganic surfaces as well as a clear transfer of the printing ink which enables a highly detailed reproduction of the master image. Moreover, the silicone elastomers of the CHT group have outstanding mechanical and chemical stabilities. In pad printing insulated components quickly move over surfaces of different potential, and this movement produces a static charge. Just like rubbing a balloon over a carpet, the insulated rubbers can become charged. 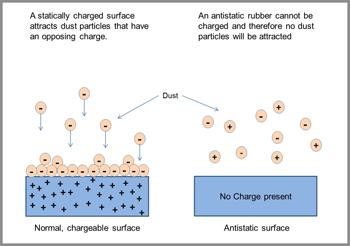 Dust particles and debris are then attracted through this static charge. When electrostatically charged pads are dipped into the colour trough, there is danger of an uncontrolled additional pick-up of the ink onto the pad. These ink splashes lead to defects and a blurred print edge. When printing on electronic components and devices, a possible discharge from a charged pad can result in sensitive circuits failing. Such a reaction can lead to the damage of the devices. How do antistatic silicone elastomers work? What advantages do they offer? The antistatic silicone elastomers developed by the CHT Group consist of conductive silicone polymers and special fillers. These pads cannot be charged while moving back and forth across different surfaces. Due to the antistatic properties of the elastomer, no ink splashes or debris are collected on the pad and the risk of damage to electronic components and devices is very low. Thus, clear and defined result from the first print to the last.